How Enterprise Mobile Apps Reduce the Risk of Heart Attack? Though deaths from cardiovascular diseases have been cut significantly, they still command a significant share and have taken the undisputed spot of been the number one killer for both men and women. This has been primarily due to rising prevalence of diabetes and obesity-related disorders. There are increasingly troubling reports of heart attacks among younger people viz even those in their 20s and 30s. So what can a person do to prevent the occurrence of heart attack? Well there is a lot a person can do to help them prevent heart attack. A study by Interheart found that 90% of the risk associated with such factors as high cholesterol, blood pressure, physical activity, diet, and smoking are within a person’s ability to control. While there are things like genetics that you cannot control, you can trump awful lot of genetics with the choices and decision you take. One of the factors that play a significant role in increasing your vulnerability to heart attack is physical activity. It is important that in order to maintain heart health, it is essential to have brisk exercise, but even regular exercises are not sufficient if you’re confined to the desk or couch for the rest of the day. For people who sit for the whole day, the risk of heart attack is the same as that of smoking. Researchers have found that sitting in front of computer for more than 4 hours can more than double the rate of serious heart diseases. So even though regular exercise is required, it very important for a person to move around during a regular work day rather than been confined to his/her desk or couch. So can person manage the balance between his work on one hand and his health on the other. This is where enterprise mobile applications come to the rescue. 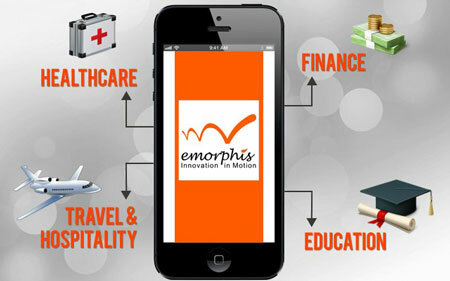 So why enterprise mobile applications have suddenly become the “must have” in organizations? Answer is simple enterprise mobile applications accomplish a larger purpose than just connect people to their software tools when they are away from their office. They help people move away from their desk as much as possible. This is critical because we spend a majority of our day at work and the nature of our work tools determine how healthy or unhealthy we are. From business perspective, enterprise mobile applications not only help you gain up-to-date information anytime & anywhere, but also help you increase productivity and enterprise collaboration. So you are able to harness the full potential of your existing infrastructure & applications and thereby increase operational efficiency, boost business & performance. So in order to develop an efficient & lean workforce it is essential that the workforce remains healthy and for the workforce to remain healthy, it is essential that organizations increase the adoption of mobile applications. Adoption of mobile applications will encourage people to cut their sedentary working lifestyle & move around for few minutes a day, thus lowering the risk of heart diseases. Organizations that mobilize their workforce may see a healthier workforce with lower risk of heart disease.